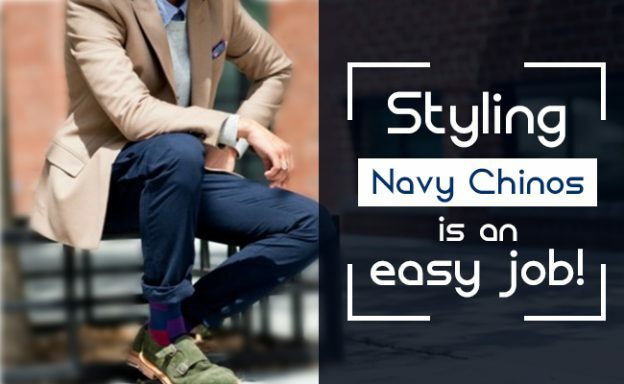 Let’s keep it simple and straight – How can we style Navy Chinos? When you think about the color of chinos, two colors hit your mind, i.e. khaki and beige shades. But make sure you don’t overdo with the colors. Well, given below are some quirky suggestions, read on to know more. Denim Shirt: For a casual look, denim shirt always works. Navy color chinos with light blue denim for a modern and a youthful vibe works as a treat. Keep your sleeves down, or roll them up, both look great. Wear your favorite desert boots or trainers and you are ready to bang on! The Patterned Top: Wearing chinos turns out to be little experimental sometimes. All you can do is wear a short sleeve or long sleeved pattern shirt for warmer months, floral or stripes in winters. Wear this and you are set for the outing with your friends or a pint of beer won’t harm. White Shirt: A crisp white shirt is a versatile piece of clothing, and styling with chinos is a good thought. If not white, you can go for a tan color. Prefer not tucking your shirt, it looks good in the both ways. Blazer: If you want a formal look, go for a contrasting combination. Try to avoid too much of a navy, otherwise it would look like wearing a suit. Another combination can be wearing a light blue chinos and wear it with a white shirt. On a Final Note: The most important thing to keep in mind before styling chinos is confidence. Don’t be afraid to mix and match the combination. Chinos can be worn from blazer to a denim shirt. So, go for it. Let us your opinions and we will be happy to read them.